Max reps or max weight on Day 4 of week 3. Do some pressing other than bench. Have fun. I used my bench press max to figure my percentages, but did the reps closegrip. The closegrips worked fantastically. My triceps felt a lot stronger through my sticking point when I maxed on bench press. Bench and squat, yes. I’d probably advise against it for DL. What about back work? And would this be effective for an intermediate lifter? I wasn’t doing much (i.e. pull-ups or rows) at the time since I was also training my DL pretty hard. And yes, it’s been effective for a lot of intermediate lifters. Thanks for posting this Greg! Why did you choose to use a close grip instead of your competition grip or a wide grip? What did your assistance work look like during the entire program? During week 4, how many training sessions did you do and what did you train? Can someone run this program for both bench and squat simultaneously? Honestly, I don’t remember exactly what I was doing. This article is almost five years old. However, you can do it for bench and squat simultaneously. Thanks a ton! Appreciate it! You say that this can work for intermediate lifters. Im an early intermediate willing to work as hard as possible. Should i use this or one of your intermediate bench programs from your 28 free programs? Is there any benefit to training this frequently for beginners and early intermediates? At last , is this program set up to increase work capacity? Could you explain the logic of this? I just want to get my OHP and squat up as fast as possible. Being an early intermediate, how often should i train them? If you’re an early intermediate, just get on any program with a logical progression scheme, and enough volume to help you grow. One of the programs from the 28 free programs would probably be a better option for you. hey greg, do you mind explaining the rationale behind this programming? how do you set up a high frequency program without being overreached by the end of the week? also i noticed the percentages used for each day are very low RPE work, will the volume translate to hypertrophy since they’re not “hard sets”? I could get away with the frequency because RPEs were so low. I assume it’s still good for growth, just becaues weekly volume is still relatively high. Hey Greg a follow this program and i hit a 10kg Pr … my question is can i run it again but how to run it with a supplemental excercises? If you hit a 10kg PR running it as-is, why would you want to change (do something different or add in a supplemental exercise)? I’m a slightly experienced casual lifter (170cm male, 65kg bw, 15% bf) who can squat ~110kg with decent form. 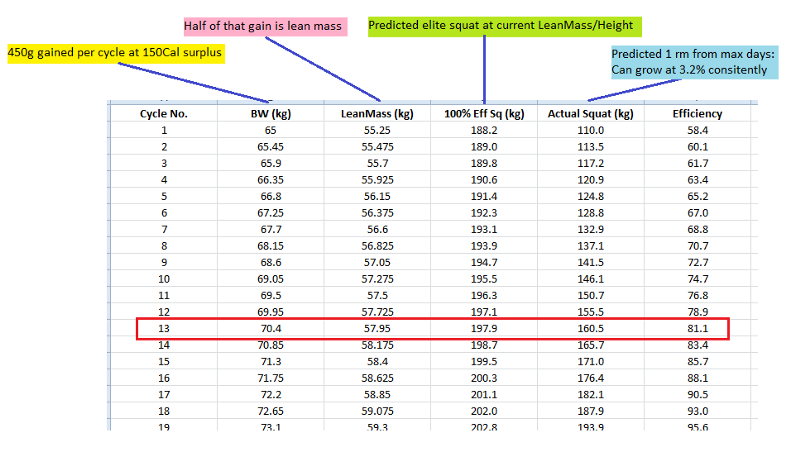 According to the Maximum Strength and Muscle potential (part 2) article of yours, my squat efficiency is at ~58%. Like you suggested over there, I plan to run the first 3 weeks of the daily program in a perpetual cycle to build up the efficiency to >80% i.e. squat 160kg at ~70kg bw. a. My expectation is that I can consistently perform 7 reps with 85% (old 6 rm) on the max day (week 3, day 4) every cycle. b. This means ~3.2% progress w.r.t predicted 1 rm each cycle. c. I’m on a 150Cal surplus. So I’ll gain 450g of bw per 3 week cycle – let’s assume half of that gain is lean mass. d. At this rate, I will need 12-13 cycles to achieve my target (110kg -> 160kg). 1. Is my plan realistic? I understand I'm making the case way too specific; but I just need some assurance from the creator of the program that my direction is OK.
2. So far (1 cycle in), it seems like a pretty low stress program – I'm confident I can run all 12 cycles. But am I wrong? Is there even a chance of burn-out given that I'm nowhere close to saturation? Thanks for your time. I love your content! Hey Anand. That sounds pretty reasonable to me. How’d the first cycle go for you? Max day of first cycle coming up in two days – hyped about it. I hope to do 7 or 8 reps with 85% based on how weights have been moving/feeling. I’ve personally made good use of this chance to work on upper back tightness and on having less of a “good morning squat”. I performed 9 reps with 85% on the max day (tagged you on Insta with the video). This is at par with my old max performance from more than a year ago (with almost no squatting for almost 9 months). I hope to keep up this momentum and newly gained confidence and hit some big PRs in the coming months. Once again, thanks for all this amazing content (and that too, for free)! I Just finished the first week of this program but I don´t feel sore/fatigued in the slightest bit, even though my diet was off almost everyday this past week (low calorie and protein intake). I’m also not used to benching 5 days a week, so it would only be logical for me to feel somewhat beaten up, right? (did 2x a week before this). Is this normal for the first week or should I increase my training max for next week by let’s say +/- 5 kg? Thanks in advance. and all the other percentages with the volume you listed for each one. Would be super easy. No effort at all. There must be something I’m not getting here…. You’re benching almost every day, and each week gets progressively harder. Strength is also about practicing and perfecting movements, not just inducing a bunch of fatigue every session.